Creating a good text marketing campaign can do wonders for your business, however there are several components that need to be put together in order for that campaign to be successful. One of those components is creating an auto reply. The auto reply is the automated text message sent to a consumer once they have opted-in for your marketing list. An auto reply is a must because today’s technology can sometimes be very confusing, and sometimes uncertainly in whether an opt-in went through or not can cause problems for both the consumer and the company. With the auto reply the customer is assured their information was received and that they are in on your list and ready to receive the exciting offers that comes along with it. To create the best auto reply there are four components that you will need. Here are those components that you need to put together. Of course the goal of your auto reply is to confirm they have successfully been added to your list. This is the time to also thank them for joining your program. There are many different ways that you can say this, but do keep in mind the limited amount of space available in a text message and choose your words, and what you will say, wisely. This is where you will work your magic. In order to get more subscribers to join in on your text message marketing fun you need to hook them in with an enticing offer of great value. For example, a restaurant could offer, as an incentive to join the marketing list, a free entrée or a free drink. A sports store could offer a free poster. You get the idea. You want to create an offer that is very valuable and appealing, and one that people cannot refuse. How Often will you text? Including the frequency of messaging you intend to pursue the customer with is important. 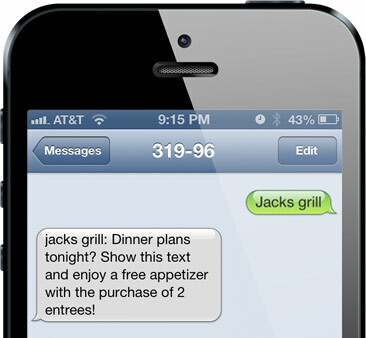 This enables the customer to know when and what to expect when they see your name pop up in their messages. It is important this be included in your auto reply a well as other forms of materials that enclose details of your marketing campaign. Most businesses find a once per week message frequency appropriate for their needs. Just as you made it simple and easy for customers to opt in for your text marketing campaign you also want to make it easy for them to opt out as well. Make sure that this information is included in the auto reply so customers know immediately how to do this. They won’t feel ‘trapped’ so it certainly benefits you greatly, along with the customers. Paying attention to your auto reply and creating one that is complete is going to score you lots of points with each person who signs up for your offer.